Mamma mia! Here’s some perfect pasta prepared at pronto speed. 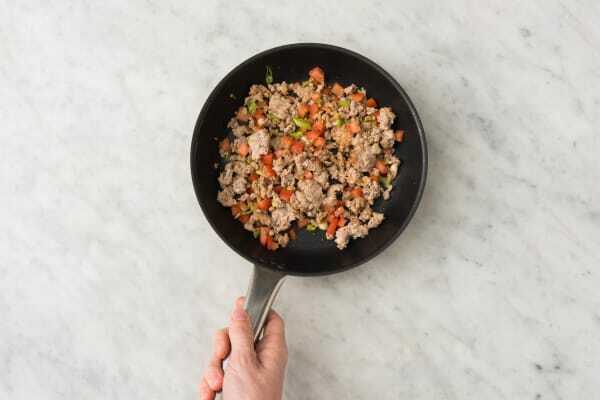 It starts with chopped tomato and pieces of chicken sausage that cook up quickly in a pan. Once you’ve got your water boiling, in go the ravioli, which become perfectly al dente in a flash since they’re fresh. After that, all you gotta do is stir in the creamy sauce and put it on a plate. Then you mangiare! Mangiare!! Just like mamma would’ve said. Bring a large pot of salted water to a boil. Wash and dry all produce. Trim, then thinly slice scallions, separating whites from greens. Dice tomato into ½-inch cubes. Quarter lemon. Heat 1 TBSP oil in a large pan over medium-high heat. Add scallion whites, sausage, and Italian seasoning, breaking up meat into pieces. Cook, tossing, until sausage is browned and cooked through and scallions are softened, 3-5 minutes. Stir in tomato and cook until just softened, 1-2 minutes. 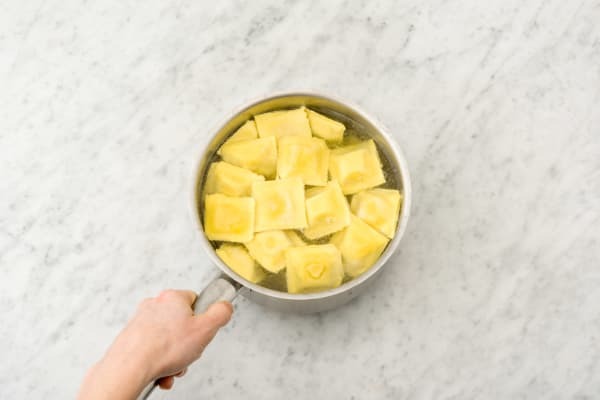 Once water boils, gently add ravioli to pot. Reduce heat to a simmer. Cook, stirring occasionally, until al dente and floating to the top, 4-5 minutes. Scoop out and reserve ½ cup ravioli cooking water, then drain. 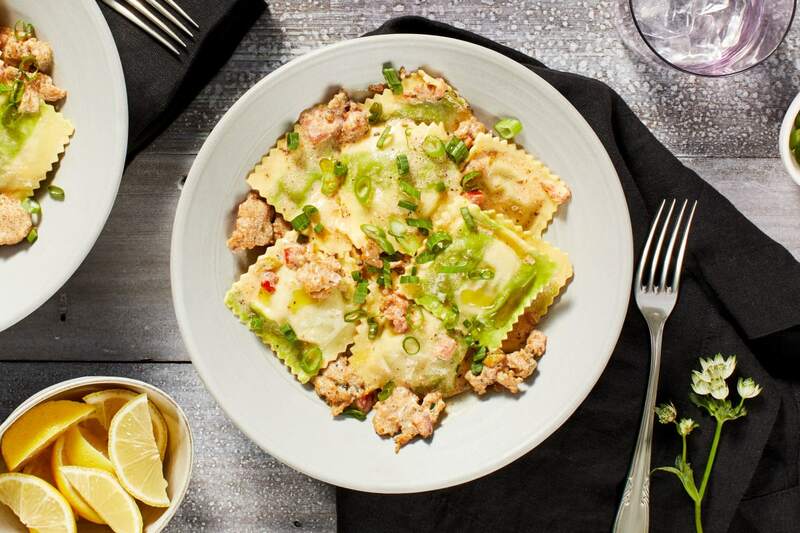 TIP: Gently shake your strainer with the drained ravioli in it to remove as much moisture as possible. 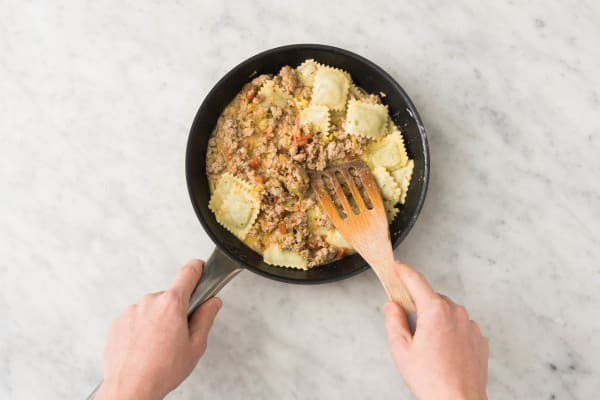 Reduce heat under pan with sausage mixture to low, then stir in stock concentrate, a squeeze of lemon juice, and a small splash of reserved ravioli cooking water. 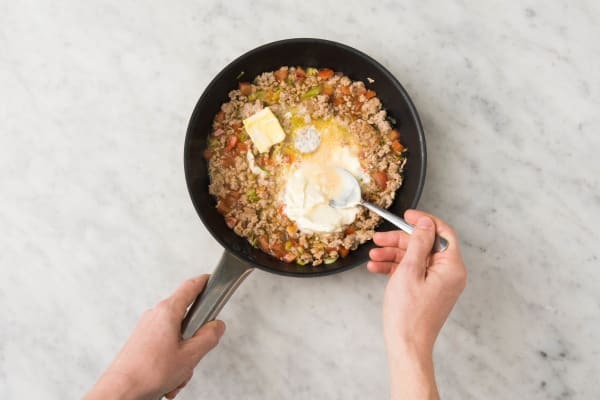 Scrape up any browned bits on bottom of pan. Stir in sour cream and 1 TBSP butter. Season with salt and pepper. TIP: Add more cooking water as needed to give sauce a loose consistency. 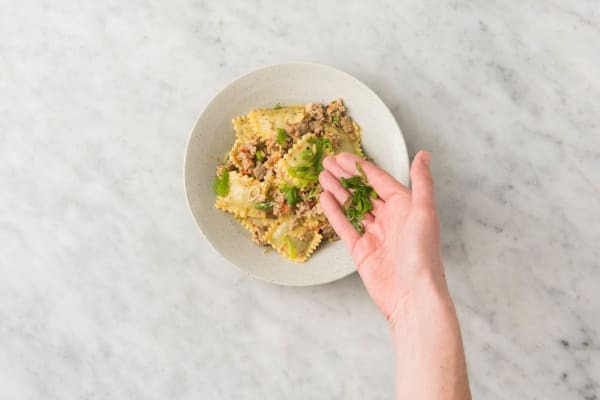 Carefully stir ravioli into pan. Season with salt, pepper, and a squeeze or two of lemon juice (to taste). Divide ravioli mixture between bowls, then sprinkle with scallion greens. 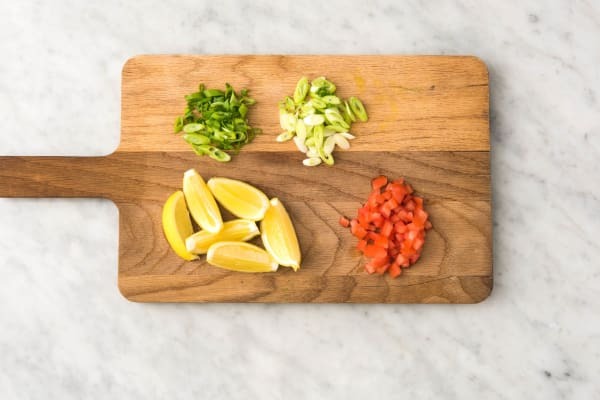 Serve any remaining lemon wedges on the side for squeezing over.